Another great package from Afterburner Decals. 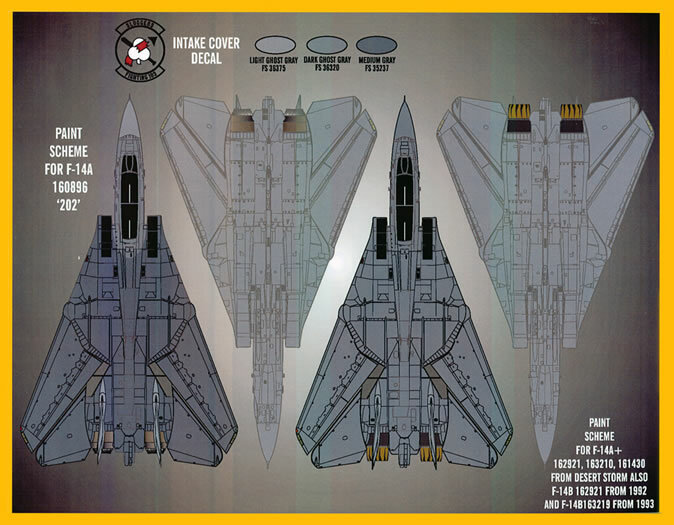 It provides you with excellent quality and complete markings backed up by comprehensive support material to produce at least three F-14s flown by VF-103. 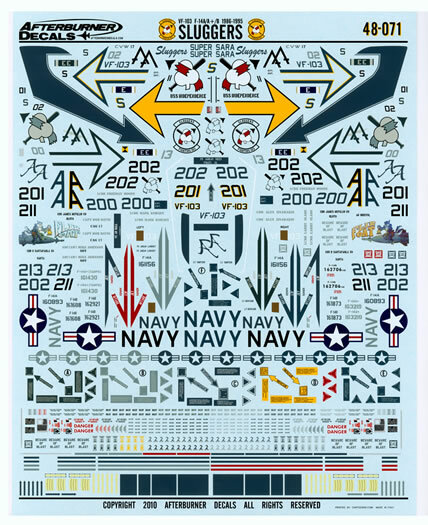 This new sheet from Afterburner Decals provides decals for the -A, -A+ and -B models of the mighty Grumman F14 Tomcat flown by the U.S. Navy’s VF-103 “Sluggers” between 1986 and 1995. For the uninitiated, VF-103’s history is that of a predominately Atlantic Fleet squadron being first established in 1952 flying the F4U Corsair. Over the years the “Sluggers” flew the F9F Cougar, the F-8 Crusader and the F-4 Phantom II. 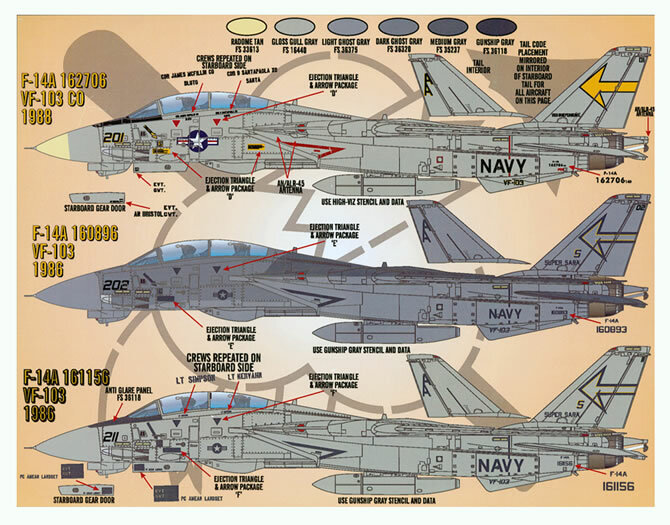 The squadron transitioned into the F-14 in January 1983 flying the –A model which they operated until transitioning to the –A+ (or –B as it also called) in 1989. 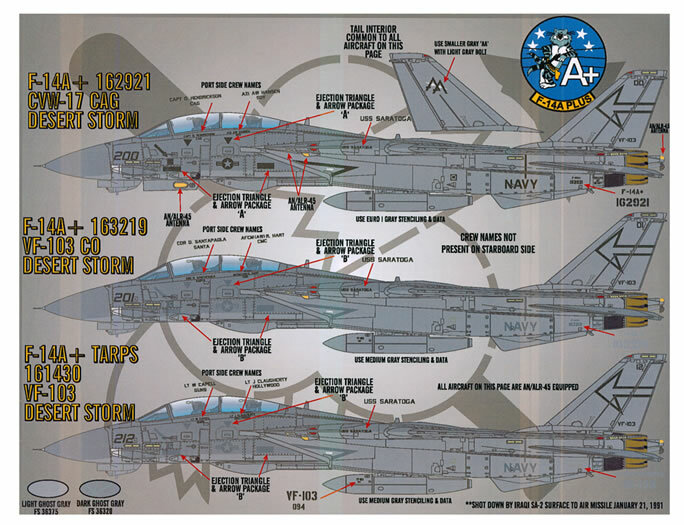 The squadron continued to operate the–A+ until squadron transitioned into the F-18F Hornet in 2004. 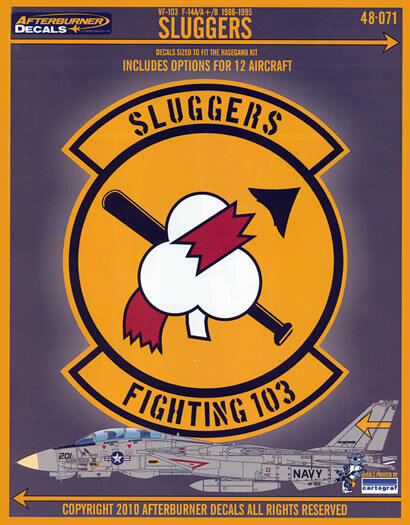 However, the “Sluggers” moniker and the various styles of their squadron insignia ceased to be used in the October of 1995 when the squadron adopted the “Jolly Rogers” legacy on the disbandment of VF-84, the previous custodians of the “Jolly Rogers” heritage. F-14A Bureau Number 162706 modex 201. 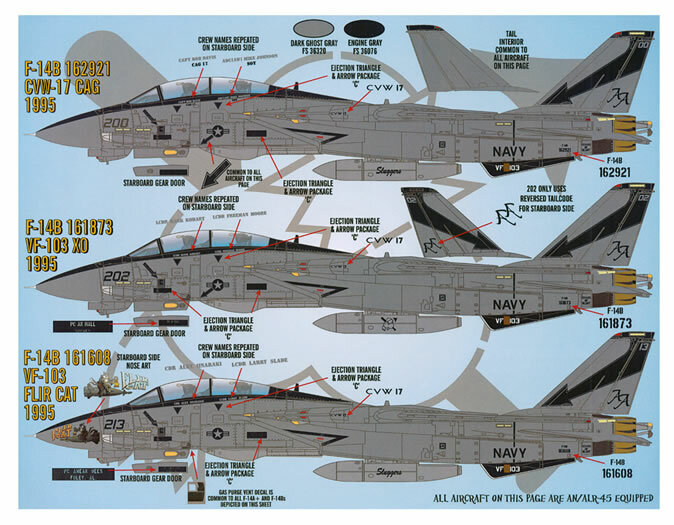 This was the Squadron Commander’s aircraft in 1988 when the squadron was embarked aboard the USS Independence. The aircraft is in the short-lived overall gloss gull grey and exhibits full colour squadron insignia on the vertical stabilisers as well as full colour national insignia and stencil data. F-14A Bureau Number 160896, modex 202, the Executive Officer’s machine from, 1986 when the squadron was aboard the USS Saratoga. The aircraft is in the standard Tactical Paint Scheme (TPS) comprising FS35237 medium grey and FS36320 dark ghost grey over FS36375 light ghost grey. It wears the squadron’s yellow arrow insignia on its vertical stabilisers edged in dark grey. The remainder of its markings and stencil data are in dark grey. F-14A Bureau Number 161156, modex 211, a line bird aboard the USS Saratoga in 1986. Camouflage scheme is gloss gull grey with dark grey markings and stencil data. The only colour she wears is the yellow of the squadron’s arrow insignia on the vertical stabilisers as well as the yellow “shadowing” of the “safety S” award, also on the vertical stabiliser. 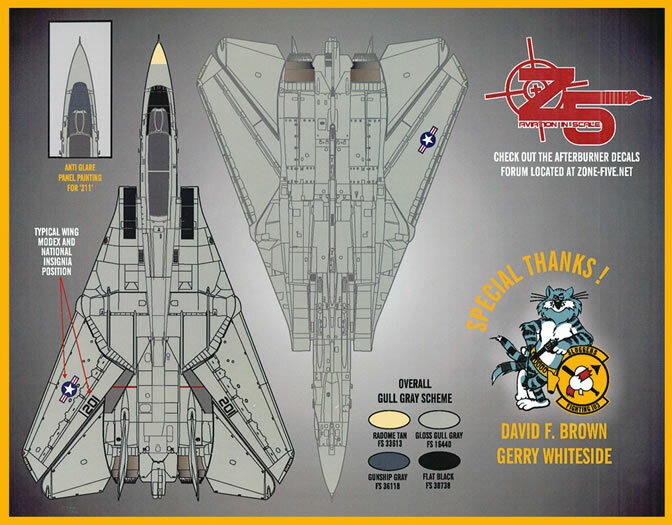 F-14A+ Bureau Number 162921, modex 200, the Squadron’s CAG bird from 1990 when the squadron was embarked aboard the USS Saratoga during OPERATION DESERT STORM. The machine is wearing a non-standard TPS comprising FS36320 dark ghost grey over FS36375 light ghost grey with all of its markings in dark grey which is unusual as a CAG bird normally wears full colour squadron markings. F-14A+ Bureau Number 163219 modex 201. This was the machine assigned to the Squadron Commander during OPERATION DESERT STORM. It wears a non-standard TPS comprising FS36320 dark ghost grey over FS36375 light ghost grey with all of her markings in dark grey. 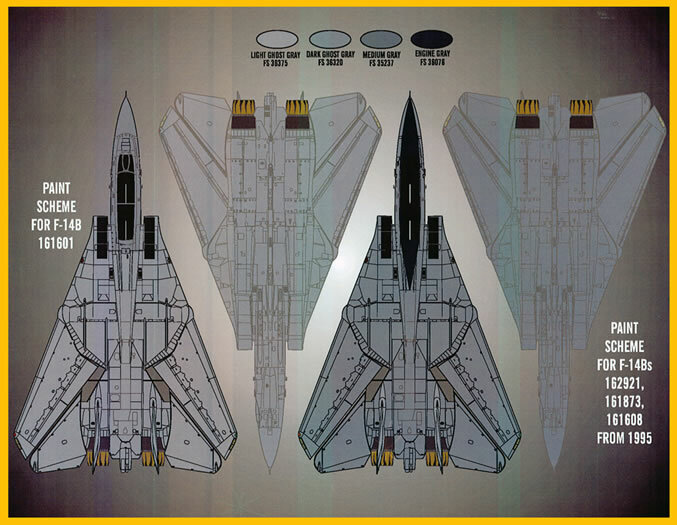 F-14A+ Bureau Number 161430 modex 212, a line bird from 1990 during OPERATION DESERT STORM. Again, it wears a non-standard TPS with all of her markings in dark grey. F-14B Bureau Number, 162921 modex 200 again, this time from 1992. Still the CAG bird and wearing the same non-standard modified TPS finish but now adorned with the old squadron insignia in colour on her vertical stabilisers along with a ‘Battle E” award ribbon bar. Stencilled squadron insignia is also worn on the external tanks. All of her markings are in dark grey. F-14B Bureau Number 163219 again but from 1993 this time. Whilst still wearing the same non- standard modified TPS finish she too is now adorned with the old squadron insignia on her vertical stabilisers in colour along with a “Battle E” award ribbon bar exhibiting two Es. Stencilled squadron insignia is also worn on the external tanks. All of her markings are in dark grey. F-14B Bureau Number 161601, modex 214, a line bird from 1993. It wears non- standard modified TPS finish as well as a lo-viz version of the squadron insignia and “Battle E” ribbon on her vertical stabilisers. All of her markings are in dark grey. F-14B Bureau Number 162921, again and still wearing modex 200. 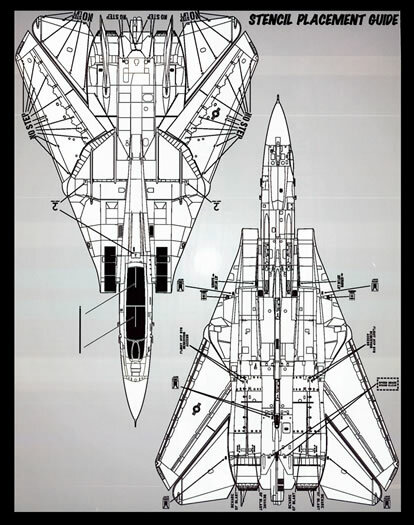 From 1995, she is now in an overall dark ghost grey scheme with her spine, squadron markings, and the tips of her vertical stabilisers as well as her ventral strakes in engine grey. The markings on her vertical stabilisers are yet another version of the squadron’s arrow markings. Slugger’s scripts are worn on her external tanks too. F-14B Bureau Number 161873, modex 202, the Executive Officer’s machine from 1995. It too wears the same overall dark ghost grey scheme with engine grey details. Interestingly, it wears clubbers insignia on her external tanks. “FLIR CAT”, F-14B Bureau Number 161608 modex 213. A line bird from 1995, it is finished in the same overall dark ghost grey and engine grey scheme. 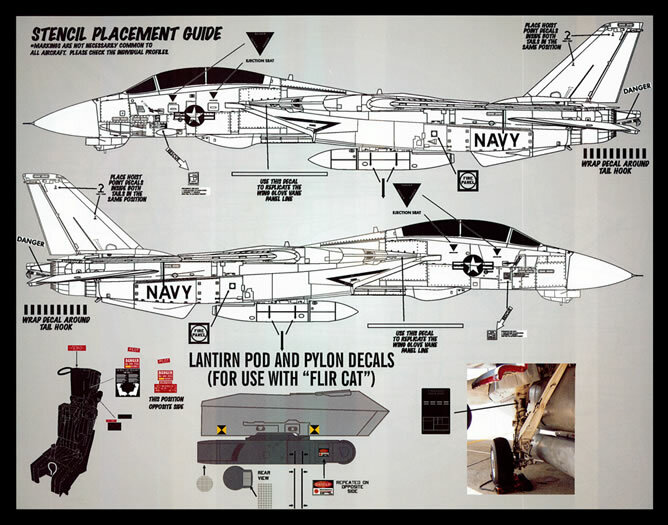 Interestingly for a naval aircraft, it wears nose art on both sides of the nose comprising of a bomb- riding tomcat carrying a lantern which is in reference to the aircraft being equipped with forward looking infrared equipment. The decals themselves have been printed by Cartograf and there are plenty of them! Two sheets are provided, one measuring 8¼” x 10¼” one that is absolutely crammed with designs, so many in fact that you will need to exercise care when separating the individual designs from the sheet to avoid damaging the surrounding ones, and a smaller 5½” x 3¼” one that contains dark grey only markings. 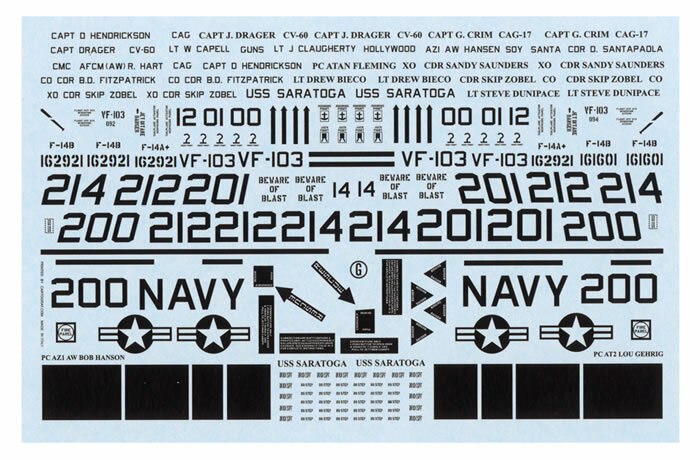 The decals are in perfect register and exhibit an absolute minimum of carrier film around their edges. There is a myriad of stencil data provided in two different greys as well as black and full colour. Decals are provided for the slime lights as well as for the walkways atop the intakes. The sheet carries stencil data placards for the undercarriage legs as well as the ejection seats and two FLIR pods. Judging by the national insignia and the stencil data you can produce three different machines from what is provided on the sheets. The placement guides come in the form of five double sided A-4 sized sheets. They present you with full colour left hand side profiles of each option along with comprehensive advice of what camouflage colours were worn by the aircraft and the colours of its markings. Large black and white line drawings of the left and right hand sides of the fuselage as well as upper and lower plan views are provided to show the stencil data (printed in large letters) and arrowed to its location and to show placement. Packaging is in the form of the ubiquitous clear plastic zip-loc bag. This is another great package from Afterburner Decals. 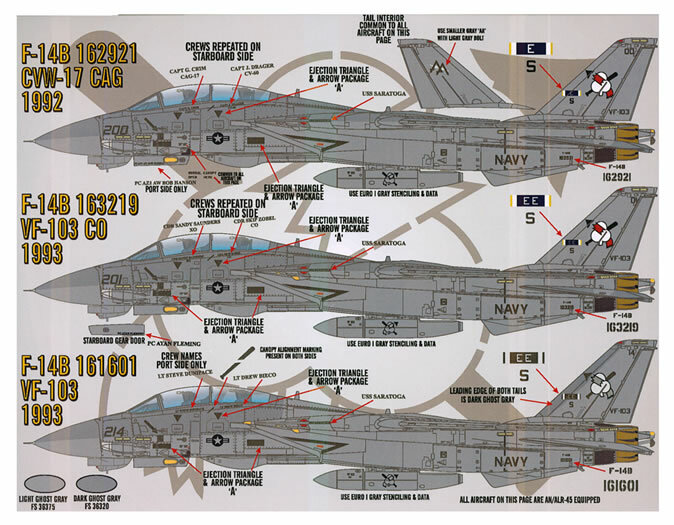 It provides you with excellent quality and complete markings backed up by comprehensive support material to produce at least three F-14s flown by VF-103.